World leaders goose-step zealously around the "two-state solution", hovering like vultures ready to carve up and divide Israel. Bibi just returned from Washington where he met with the chief supporter of this plot, President Obama. There, he was told in no uncertain terms that Jewish couples in Judea and Samaria cannot be allowed to have children or build homes, and that the US intends to negotiate with Iran, and not deal with the nuclear ayatollahs militarily. To his credit, Bibi did not fold under the intense pressure. One this is clear: the United States is preparing to sacrifice Israel as a scapegoat for "peace" and "reconciliation" with the Arab world. The two-state solution is a Final Solution to the Zionist Problem. 80% of Israel's population is concentrated on the coastal plain. If Israel's frontiers would be reduced to the "Auschwitz lines" (as Abban Eban famously dubbed them), every single major Israeli city would be under the threat of rocket fire. The situation that was produced in Sderot following the 2005 Disengagement would repeat itself all over Israel as any new "Palestinian" state would quickly become a launching pad for Islamic terror. Dr. Yuval Steinitz, former Knesset Foreign Affairs and Defense Committee chairman, said that the idea of a two-state solution should be dead. “A Palestinian state in Judea and Samaria ,” he said, “would bring about Israel ’s demise. … Such a Palestinian state would immediately become an outpost for Iran ” (Jerusalem Post, September 14, 2008). Besides the obvious strategic and military threat that a terror-state in the heart of Israel would pose, there is an even greater ideological danger inherent in a two-state solution. In essence, a two-state solution would mean the death of Zionism and the abandonment of the Jewish dream. The Nation of Israel arose in the Land of Israel. The Bible provides the clearest proof that the Land of Israel belongs to the Jewish people and to no other nation. For hundreds of years, the Jews lived in the land, established a monarchy under King David and Solomon, and built the First Temple in the capital city of Jerusalem. When the first Jewish kingdom was destroyed by the Babylonians in the 6th century BCE, they razed Jerusalem, burnt the Temple and carried away the Jewish defenders into exile, in Babylon. The Bible records how the Jews bitterly mourned the loss of their independence and homeland, and resolved to return. "By the rivers of Babylon, there we sat, we also wept when we remembered Zion... If I forget you, O Jerusalem, may my right hand forget [its skill]. 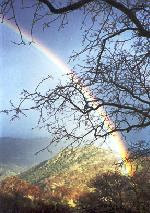 May my tongue cling to my palate, if I do not remember you, if I do not bring up Jerusalem at the beginning of my joy." (Tehillim 137). 70 years later, when the Persian emperor Cyrus allowed the Jews to return home, tens of thousands set out under the guidance of Ezrah the Scribe and Nehemiah. They rebuilt the desolate cities of Judea and reconstructed the Temple in Jerusalem. 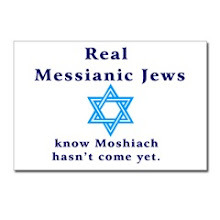 For centuries, the Jews lived semi-autonomously under Persian and Greek rule, until the Maccabbees revolted against Greek religious persecution. For another 100 years, the Jews enjoyed sovereignty under the Hasmonean dynasty. This independence was brought to an end with the Roman conquest and following several revolts, the Second Temple was burnt and the Jewish population carried into slavery and exile. During the three millenia since Joshua first conquered the Holy Land until today, there was never another people that established a state in Israel. Never was there a sovereign nation by the name of "Palestine". The Arabs living in the Land of Israel never considered themselves to be part of a distinct "Palestinian" people. The only entity to ever have its independence in Israel was and remains the Jewish people. "Palestine is a term the Zionists invented.... Our country for centuries was part of Syria," remarked Arab leader Auni Bey Abdul-Hadi to the British Peel Commission in 1937. Certainly, Mr. Abdul-Hadi had the honesty to admit the fraud that is "the Palestinian people". Before the State of Israel was founded, Jews and Palestine were synonymous. Jews founded the Palestine Post, the Palestine Symphony Orchestra, the Palestine Electric Company. The Arabs were referred to as Arabs and not Palestinians. Only in 1964 was this bogus term invented when Gamal Abdl-Nasser created the phony nationalism of the Palestinians. The differentiation between Israel pre-67 and beyond "the Green Line" is entirely arbitrary and simply reflects the armistice line at the end of Israel's War of Independence (a war initiated by 6 Arab countries with the intention of "throwing the Jews into the sea". There is absolutely no difference between the right of Jews to live in Tel-Aviv, Herzliah or Haifa and Hebron, Shechem and Beit El. In fact, Hebron was the first capital of the Jewish people under King David, while Tel-Aviv was only founded 100 years ago. Judea and Samaria are the heart of the Biblical homeland, where our Patriarchs walked, our Kings fought and conquered, our Prophets warned and proclaimed. A judenrein Judea and Samaria would be the greatest travesty of history and would undermine the entire basis of the dream of the return to Zion. "With the two-state solution, in my opinion, Israel will collapse, because if they get out of Jerusalem, what will become of all the talk about the Promised Land and the Chosen People? What will become of all the sacrifices they made - just to be told to leave? They consider Jerusalem to have a spiritual status. The Jews consider Judea and Samaria to be their historic dream. If the Jews leave those places, the Zionist idea will begin to collapse. It will regress of its own accord. Then we will move forward." For two thousand years, Jews dreamed of going home, of returning to the land of their forefathers and having their own country. Three times a day, observant Jews turn towards the East and beseech G-d: "May our eyes behold Your return to Zion in mercy". Jews declare at the end of every Passover seder and Yom Kippur fast: "Next year in Jerusalem!" The ties that the Jewish people have to Israel are deeper than those of any other people to its land, long preceding the creation of "Palestinians" in the 1960s, or even the birth of Muhammad and the spread of Israel. Before France was French and before Spain was Spanish, Israel was Jewish. When London was still forest and Rome was just a collection of villages on the Tiber, Jerusalem was already the capital and spiritual center of the Jewish people. Jews in the various exiles, Morocco and Poland, Iraq and Russia, Yemen and Greece, did not long for the Holy Land simply for it to be turned over to another people. Friday marks 42 years since Judea, Samaria and Gaza were liberated and Jerusalem reunified under Jewish control. 800 Jewish soldiers gave their lives in defense of Israel against the Arab invaders during the Six Day War, and bravely liberated our biblical homeland. For 19 long years, the Jordanians illegally occupied Jerusalem, drove the Jews out of the Old City, desecrated synagogues and Jewish cemeteries and closed the Kotel to Jewish prayer. Hundreds of courageous Jews paid for Jerusalem with their blood and in June 1967, for the first time since the Romans destroyed Jerusalem, Jerusalem was reunited in Jewish hands. The sheer euphoria as it was proclaimed on the radio "the Temple Mount is in our hands!" was indescribable. Even the most secular soldier broke down in tears in front of the Western Wall, when he realized the momentousness of the battle. Today, the battle for Jerusalem and for the Land of Israel continues. We must remember the bravery of Joshua, of David, of the Maccabees, of Bar Kochba and those who fought the Romans, and our modern day heroes of the IDF. We must have the courage to proclaim that the entire Land of Israel belongs to the Jewish people and that we do not recognize the legitimacy of the claims of any foreign entity on our land. The State of Israel only exists today because it is sitting on the shoulders of the generations of good Jews who, in all of their lands of dispersion, never forgot the dream, the two-thousand year old hope "to be a free people in our own land, the land of Zion and Jerusalem". A hope that overcame the Romans, the Crusades and Inquisitions, pogroms and persecution, Auschwitz and Treblinka, will certainly overcome the most nefarious plots of our enemies. The Six Day War had ended. The generals assembled the commanders and foot soldiers for a customary review and analysis of the battle. After the military questions had been asked, and the investigative committee was about to disperse, a commanding officer pointed to one of the soldiers. "Wait a minute. I have a question for you. 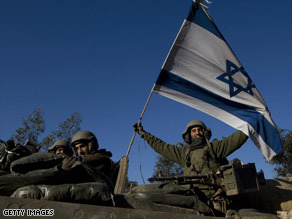 Yes, you, the soldier who put up the flag on the Temple Mount." "Where did you get an Israeli flag, and why did you put it up?" The night before the Old City was liberated, a contingent of soldiers fighting near the Old City took cover in a shelter in a Jerusalem neighborhood. Hordes of children, mothers, old men and women packed inside the bunker alongside the soldiers. People looked frightened and bereft. The government had imposed a news black-out so that the Arab countries wouldn't be able to figure out their positions. And the news -- originating from Jordan, Egypt and Syria -- was enough to induce hysteria: calls from Saudi King Faisal for the total elimination of Israel, calls from every Arab country to push the fledgling country into the sea. As the soldier sat there in the bunker, hopeless and uncertain, he saw an old woman slowly make her way over to him. "Excuse me," she said, standing at his side. She held a satchel in her arms. He lifted his eyes. "Yes, Doda. Tell me, what is it?" "Tomorrow you'll go to the Old City and you'll go to the Kotel." He shook his head at the absurdity. He said, "No, we won't." There were no army plans to liberate the Old City. First, they were fighting just to hold their positions. Also, overtaking the Old City would entail hand-to-hand combat which was greatly feared: Many people would die. Moreover, any bombardment of the Old City might demolish even more of the holy sites than had already been destroyed by the Jordanians. He tried to explain all of this. The old woman looked at him, steady-eyed. "No, you will go," she said, not as if she were trying to convince him, but as if relaying simple facts. He shrugged. An old woman's delusions. He wasn't going to argue with her. Before he turned away, she said, "I have a favor to ask you." She reached into her satchel and took out an Israeli flag. From the way she touched it, it was clear the flag had some personal meaning for her. Had she made it? Perhaps it had been draped over a loved one's grave? But what was she now saying? "When you go, please take this flag, and when you get to the Temple Mount, I want you to hang it up there." She held out the flag. The soldier repeated, "We're not going into the Old City." "You're going," she said. Again, she held out her arm. A thought struck him. "I can't take it," he told her. "It's against army regulations." "It'll be all right. Just take it." "I'll get in trouble. You're only allowed to carry a few specified items." Please," she said hoarsely. "Do me this favor." He shrugged again. Why was he arguing with this old woman? Let him take the flag, let him make an old woman feel good. He could always get rid of it later. The next day, the Israeli army, contrary to everyone's expectations, took the Old City. Sure enough, the soldier's unit ended up at the Temple Mount. 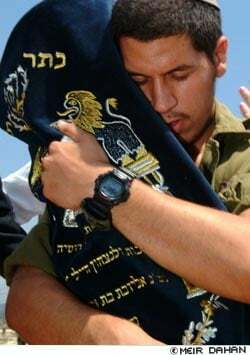 As he and the other soldiers came close to the Western Wall, he suddenly remembered the flag and the old woman's words. Yes, he would do it, he would! He enlisted two buddies, and together they draped the flag over the grating on the upper left most side of the Kotel, and there they hoisted and hung the Israel flag. The commanding officer conducting the investigation said to the soldier, "And what were you thinking when you put up that flag?" The soldier said, "I was thinking that this was the answer to 2,000 years of Jewish suffering." And so ends the story of the soldier, our hero. But there's an unsung hero, too. What about the old woman who supplied the flag? One wishes the investigating officers had tracked her down. What did she have in mind as she entered a shelter with an Israeli flag in her satchel? And who was she, anyway? The only identifying feature is that she was old and carried a bag. But her advanced age already tells us plenty: that she knew something about Jewish history, probably having personally lived through it...World War I, Arab attacks, the Holocaust, the War of Independence, 1956. What hadn't she seen? There, in Israel's darkest moment, outnumbered and surrounded by enemies, terrified that the next morning there will be no Israel, the old woman sees what no one else can see, what no one else is capable of conceiving. She insists on her vision, she practically browbeats the soldier into carrying out her plan. We'll never know how she knew, only that, like many Jewish women before her -- the Matriarchs, the midwives in Egypt, the righteous women in the desert -- she just knew. There are two kinds of prophecy. One that predicts the future, and one that makes the future. While the Pope's speech at Yad Vashem left much to be desired, he had no such restraint when speaking at a "Palestinian" refugee camp. Speaking before Israeli officials, government representatives and Holocaust survivors at the Yad Vashem memorial in Jerusalem, the Pope could not bring himself to mention the words "Nazis", "murdered" or "six million", nor did he apologize for the silence of the Vatican during the war, and its apathy to the plight of the Jews. The chairman of the Yad Vashem Council, Rabbi Yisrael Meir Lau, who is a Holocaust survivor, expressed disappointment at the pope's speech, saying that "there certainly was no apology expressed here. Something was missing. There was no mention of the Germans or the Nazis who participated in the butchery, nor a word of regret," Lau said. "If not an apology, then an expression of remorse." Despite this, the Pope did not hold back in his call for an Arab terror state in the heart of the land of Israel and the return of the Jewish people to exile. Speaking before Fatah arch-terrorist Mahmoud Abbas, the Pope declared his support for "a sovereign Palestinian homeland in the land of... [their] forefathers". He used the opportunity to criticize Israel over erecting a security fence designed to prevent Islamic suicide bombers from blowing up Jewish men, women and children in cafes, restaurants and discotheques, a security fence only made necessary by relentless Islamic terror. Abbas, who is constantly referred to as a "moderate" in the West, used the opportunity to lament "the Nakba [catastrophe] 61 years ago" ie. the founding of the State of Israel. Straight from Yad Vashem, the Pope allowed himself to be used as propaganda for those who seek to delegitimize and demonize the Jewish State. PA spokesmen used the Pope's visit to reiterate the Arab "right of return", the flooding of Israel by Arab refugees with the intention of demographically destroying the state. The Pope's pilgrimage is a case study in hypocrisy, falsehoods and lies. The Pope may have cried crocodile tears at Yad Vashem but he is far from expressing remorse over the Holocaust. His Church has been consistent in whitewashing its wartime record, reinstating Holocaust-denying bishops, promoting ludicrous and obscene comparisons between the Nazis and the IDF, as well as supporting the Durban II conference, in which a Holocaust-denying and genocide-enabling leader was the keynote speaker. The Pope has launched a campaign to exonerate Pope Pius XII, the Pope who closed his eyes as the Jews of Rome were round up from beneath his window, without hurting Jewish sensitivities. The Pope caused a huge scandal when he lifted the excommunication against a bishop who stated that there is no proof that gas chambers ever existed, and only relented after international outcry. Cardinal Renato Martino, the head of the Vatican Council for Justice and Peace and a former Holy See envoy to the United Nations, provoked an uproar when he repeated the revisionist libel that Gaza today resembles a Nazi concentration camp. In addition to this damning record of Holocaust-denial, obfuscation and unwillingness to confront the past, he met with Fatah leader Mahmoud Abbas, whose doctoral dissertation questions the veracity of the Holocaust and argues that Zionist leaders collaborated with the Nazis in the extermination of European Jewry. He writes in his thesis: "It seems that the interest of the Zionist movement, however, is to inflate this figure [of Holocaust deaths] so that their gains will be greater. This led them to emphasize this figure [six million] in order to gain the solidarity of international public opinion with Zionism. Many scholars have debated the figure of six million and reached stunning conclusions—fixing the number of Jewish victims at only a few hundred thousand."" This "moderate" Holocaust denier was also involved in the 1972 murder of Israeli athletes at the Munich Olympics, and countless other terrorist attacks. The Vatican has consistently promoted the internationalization of Jerusalem and taken a pro-"Palestinian" stance. It was only in 1993 that the Vatican recognized Israel. The reason for this hostility is that the State of Israel and Jewish sovereignty over Jerusalem poses a tremendous theological problem for Catholicism. Church doctrine taught for millenia that Jews were "the witness", cursed to wander without a home as proof of their rejection of Jesus, and that they would never return to Israel. In 1948, and then again in 1967, an enormous issue was raised for theologians. By expressing support for a "Palestinian" state in the "land of their forefathers", the Pope is continuing this same deadly replacement theology. One would think that the supreme pontiff of the Catholic Church would at least have a cursory knowledge of Scriptures, which says quite clearly that the Land of Israel belongs to the Jewish people. He must certainly be aware that there has never in history been a sovereign "Palestinian" state, nor was there ever a distinct "Palestinian" people, culture or entity. In fact, the "Palestinian people" were invented only in 1967 when it became apparent to the Arabs that a new strategy had to be devised to throw the Jews into the sea. Certainly the world's oldest people, with ties going back to the Bible, over 3500 years ago, should not be expected to give up its homeland to make room for the world's newest people, an artificial entity created 42 years ago. The people today referred to as "Palestinians" are squatters and invaders, having arrived in the 1900s from Jordan, Egypt, the Maghreb and Syria, attracted by the increased living standards caused by renewed Jewish settlement in Israel. The Vatican has a lot of chutzpah. The original Jewish olim from Eastern Europe left for Israel because Church-taught hatred had made life so miserable for the Jewish people. During our entire sojourn in Catholic lands, we never had a moment of rest as we were persecuted and oppressed. The Church taught that Jews were wicked, sons of satan, and forced them to wear distinctive clothing and live in ghettos. Thousands of Jews perished at the hands of crusading swords or on the racks of the Inquisition. Entire communities in France and Germany were wiped out during the Crusades as mobs burst into Jewish homes and demanded: "Kiss the cross or kiss the sword!" The Holocaust, the most horrendous crime humanity ever committed, was only possible because of the two-thousand years of Christian anti-semitism. After watching the Oberammergau Passion Play in 1934, Hitler said out loud: "Perhaps I am rendering to Christianity the best service ever!" Having left, for the most part, Catholic lands for our own soils, the Pope has now followed us, demanding that we give up our land. Jews left Christendom yet Christendom has chased after us, pointing us back to the exile, to subjugation and lowliness. I would like to point the pontiff to the Book of Joel. He would be wise to read and digest the fourth chapter, which speaks of the fate of those who divide up G-d's land. "For behold, in those days and in that time when I return the captivity of Judah and Jerusalem, I will gather all the nations and I will take them down to the Valley of Jehoshaphat, and I will contend with them there concerning My people and My heritage, Israel, which they scattered among the nations, and My land they divided... And Egypt shall become desolate, and Edom shall be a desert waste, because of the violence done to the children of Judah, because they shed innocent blood in their land. But Judah shall remain forever, and Jerusalem throughout all generations. Now should I cleanse, their blood I will not cleanse, when the Lord dwells in Zion." 61 years after the return of Jewish independence, and 62 after the liberation of Jerusalem, Judea and Samaria, the world still disputes our rights to our home. We must not fear since even when Edom ie. the Church and the West will be a "desert waste", "Judah will remain forever!" 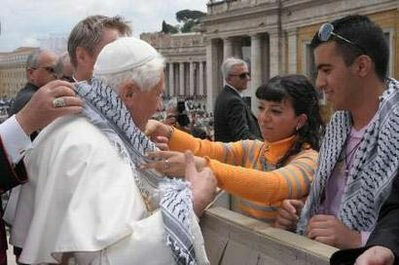 Pope may come and go, but the Jewish people are firmly planted in their homeland. Note: I was asked to asked to justify Israel's operation in Gaza in January. My opinion on the operation can be found throughout my posts and articles. Rather than right an entire article, I thought that I would refute point by point the lies and misinformation disseminated by fellow blogger Young Activist. His article can be found in italics, with my commentary. 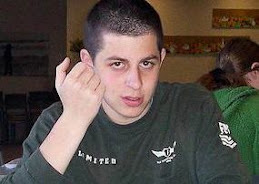 An Israeli intelligence officer acknowledged the IDF was targeting "both aspects of Hamas -- its resistance or military wing and its dawa, or social wing," Bombing schools, hospitals, universities, the water system, police stations, and other civilian infrastructure was entirely justified because, as NYT correspondent Stephen Erlanger makes clear, "in a war, [Hamas's] instruments of political and social control were as legitimate a target as its rocket caches." Of course, when Hamas acts on a smaller scale, but in a similar fashion, it must be denounced as terrorism. My fellow blogger is making a false distinction between Hamas's military and "social" wings. They are both parts of the same entity, Hamas using its "social" wing to build schools that indoctrinate Arab children in hatred. Just as the Allies during WWII made no distinction between the Nazi Wehrmacht and the social centers built by the Nazi regime, so too this is completely irrelevant. The media has succeeded in portraying the Arabs of Gaza as poor victims of Israeli aggression. Such a characterization is demeaning and in fact bigoted, because it implies that the Arabs cannot be held accountable for their own actions, essentially infantilizing them. Israel withdrew its 7000 Jewish citizens from Gaza in 2005, in a bid to give the Arabs a chance at self-government and a better future. Israel poured aid into the Gaza and even left behind the greenhouses and agricultural infrastructure that had made the Jewish communities so successful. While Israel extended the olive branch, they got terror in return. In the 2006 Palestinian elections, Hamas was elected with a clear majority of 74 of the 132 available seats. Hamas is recognized as a terrorist organization by the United States and the European Union. It was founded with an explicit dedication to the destruction of the State of Israel and has carried out hundreds of murderous suicide and other terrorist attacks against Jewish targets. Hamas' charter is based on rejections and says that "Israel will exist and will continue to exist until Islam will obliterate it, just as it obliterated others before it." Lest anybody claim that Hamas makes a distinction between Jews and Israel, its charter declares its genocidal intent. "The Day of Judgement will not come about until Muslims fight the Jews (killing the Jews), when the Jew will hide behind stones and trees. The stones and trees will say O Muslims, O Abdulla, there is a Jew behind me, come and kill him. Only the Gharkad tree, would not do that because it is one of the trees of the Jews." (related by al-Bukhari and Muslim)." Concerning this intended genocide, the charter promises that " the Islamic Resistance Movement aspires to the realisation of Allah's promise, no matter how long that should take." To claim that the Arabs who voted for Hamas as their legitimate representatives were not aware of their goals and aspirations is simply dishonest. The Arabs of Gaza must take collective responsibility for freely choosing Hamas as their government. During the past 3 years, there was not a single protest against Hamas using homes, schools, hospitals and mosques to fire rockets against Israeli civilians. The Arabs cannot allow Hamas to use their homes as rocket launch pads while at the same time claim innocence. NYT correspondent Stephen Erlanger's statement reveals a dangerous lack of moral clarity and hypocrisy. There is no comparison between a terrorist organization attacking civilians and a sovereign state trying to protect its civilians. This is the same twisted mentality that would denounce both a robber and the law enforcement officer who tries to neutralize him. If Israel's apologists are to be believed these actions, namely the firing of rockets, necessitated the bombing and subsequent invasion of Gaza. The attack was launched to save lives, Israeli lives that is, Palestinian blood is worthless. But even if we accept the premise that Palestinian deaths are of no consequence this justification quickly falls apart. This last statement is mere rhetoric, intending to portray Israel as a racist state. The obligation and responsibility of the Israeli government is to protect Israeli citizens, just as it is Russia's duty to protect Russian citizens. Six months before the offensive began in earnest Hamas and Israel signed a cease fire: both sides would halt their attacks and Israel would open the borders. Rocket attack essentially stopped, although a trickle of fire from dissident groups continued with no fatalities, but Israel refused to open the borders. Nonetheless Hamas was interested in a renewal of the cease fire before it expired, Israel repudiated this offer with violence. This was not the long term settlement endorsed by Hamas and the entire world save Israel and the U.S where Israel and Palestine would recognize each other on the June 1967 borders and all hostilities would cease, this was a short term agreement to end immediate attacks. Israel not only refused to renew the cease fire, it violated it with a Nov. 4 raid that killed several Palestinian fighters. Hamas never abided by the truce for even a moment. Almost immediately after the truce was signed in June 2008, Hamas fired rockets into Israel. 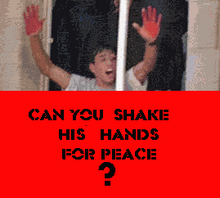 Despite such a flagrant violation of this truce, Israel promised "restraint" . In fact, during the entire 6 month truce period, Hamas fired a total of 329 rockets at Israel . Immediately, and predictably, Hamas responded with a barrage of rockets in what the MFA acknowledged was "retaliation" for Israel's violation of the cease fire agreement. If the sole objective of Israel's leaders was to save Israeli lives they would have pursued an extension of the cease fire. The attack, as predicted, resulted in more Israeli deaths. 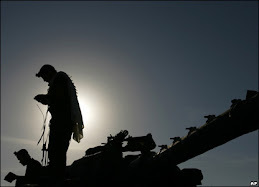 As it launched its offensive the IDF was preparing for scores of Israeli casualties, in the end only eleven Israeli soldiers were killed, several by friendly fire, but this was still many more than had been killed in the preceding six years by rocket fire. Dozens of Israelis have been killed by Hamas rocket attacks. The small number of casualties has been nothing short of miraculous yet it is twisted thinking to argue that Israel should have waiting until a higher number of Jews had been killed before responding. The air attacks began shortly before noon on the Sabbath, Dec. 27 just as children were returning from school and midday crowds were out on the streets. Within moments over two hundred people were dead. Israel's deterrent capabilities, terrorism is lay man's terms, were quickly reestablished to the applause of over 90% of the non-Arab population. One Israeli political analyst predicted that the parties of then Prime Minister Ehud Olmert's governing coalition would capture one additional seat in the upcoming Parliamentary elections for every forty Palestinians killed, a prediction that ultimately proved false but still reflected well on the mood of the country. Israel's PR arm has claimed civilians were warned to leave by the world's most moral army before the fighting began, they couldn't leave the conflict zone through the sealed border crossing, but Israel nonetheless quickly absolved itself of all blame for deaths inflicted by its forces. Unfortunately civilians were not given an opportunity to flee, the result was nearly a thousand dead Palestinian non-combatants. Writing in the nation's leading newspaper Israeli intelligence analyst Reuven Pedatzur noted "[t]he IDF, which planned to attack buildings and sites populated by hundreds of people, did not warn them in advance to leave, but intended to kill a great many of them, and succeeded." Indeed, on one occasion Israeli soldiers ordered a family to evacuate the fighting to a shelter which they promptly bombed, killing scores of people. Israel's army went to great lengths to prevent unnecessary civilian casualties, unfortunately often putting Israeli soldiers in harm's way. Following international allegations that Israeli soldiers acted immorally in Gaza, Israel's military launched an investigation into the matter. The military probe revealed that there was little truth behind the accusations. Maj. Yehoshua Gurtler, a military lawyer, said that "these allegations were based on hearsay. They were not based on firsthand evidence. They were rumors. They did not reflect the operational circumstances which had actually taken place on the ground." We are still waiting for the NY Times and other news agencies to publicize the findings with the same zealousness with which they smeared the reputation of the Israeli army. The IDF made little effort to distinguish between civilian and military targets, often it deliberately attacked civilian targets. It bombed a U.N school housing refugees killing scores of innocents claiming it was sheltering Hamas fighters, a claim the IDF was later forced to retract, it destroyed the warehouse of UNRWA on whom most Palestinians depend for sustenance, it used banned chemical weapons against civilians, it destroyed the al-Quds hospital where hundreds of terrified residents had taken shelter, it refused to allow emergency aid in, ramming and nearly sinking a relief vessel in international waters, and shooting at ambulances attempting to evacuate the injured during Israel's "three hour daily humanitarian cease fire". These reports come from Palestinians, the U.N, and those westerners in Gaza when the attack began, the IDF refused to allow foreign doctors or journalists into Gaza. Who did they want to die from lack of medical attention? What were they hiding? Perhaps the scale of the violence was too great even for Israel's well oiled propaganda machine to talk away. IDF soldiers, some of whom proudly dawned T-Shirts bearing images of a pregnant Palestinian women in a sniper's crosshairs with the words "1 shot 2 kills", killed even the animals at the Gaza zoo during their rampage through the coastal enclave. Just as in the case of the case of the 2002 Jenin massacre that wasn't, Israel was falsely accused of crimes against humanity. rael faced a similar rush to judgment after reports of an Israeli attack on January 6, 2009 on a UN-run school in Jabalya. The building was not being used as a school at the time but was sheltering Palestinian noncombatants. Initial reports said at least 30 (the figure was later revised to 43) Palestinians were killed and UN officials claimed they had given Israeli forces coordinates of this building and others that they said were not associated with Hamas. The incident was immediately portrayed as a deliberate Israeli attack on innocent people. Journalists who investigated the incident and spoke to eyewitnesses, including a teacher who was in the schoolyard at the time of the shelling, concluded that no one in the school compound was killed. “The 43 people who died in the incident were all outside, on the street, where all three mortar shells landed.”[5c] As the Globe and Mail noted, this is very different than the UN’s allegation that the IDF had fired into a schoolyard crowded with refuge-seekers. Norwegian Mads Gilbert, one of only two western doctors on hand for much of the conflict, estimated half of the casualties were woman and children and almost all casualties in Israel's "[a]ll out war against the civilian population of Gaza," were civilian. But perhaps the onslaught was justified, because as the Jersusalem Post noted one Sephardic Rabbi wrote to the Prime Minister that there is "absolutely no moral prohibition against the indiscriminate killing of civilians during a potential massive military offensive on Gaza aimed at stopping the rocket launchings," Perhaps the only fault in killing over 1,300 people, mainly civilians, was that it did not go far enough in reestablishing Israel's deterrent and it failed in returning Kadima to power. Perhaps a 100:1 kill ratio was just not good enough. Perhaps what Israeli commentators frequently refer to as the "Palestinian peace offensive" was not sufficiently thwarted. As for the official pretense, the attack was, as predicted by Israeli officials, counterproductive to its declared aims. When the fighting subsided thirteen Israelis were dead and Hamas remained in power in Gaza, more popular than ever. Pure anti-Israel rhetoric. Official Israeli statistics put 300 of the 1200 casualties as civilians . This amounts to one-third, not the two-thirds Arab propagandists claimed. This is a much lower rate of civilian casualties than the United States in Iraq or Afghanistan, Russia in Chechnya or NATO in the Balkans. It is despicable to argue that Israel's operation was not justified because a fair or equal amount of Jews hadn't been killed. Close to 100 000 civilian have been killed by violence in Iraq . When Operation Enduring Freedom began in 2001 in Afghanistan, the US launched an indiscriminate bombing campaign. Two US jets accidentally killed 100 people and wiped out an entire village in Eastern Afghanistan. The high number of civilian deaths have led Afghan President Hamid Karzai to complain to the US. To combat Chechnyan terror, the Russian army essentially decided to level Grozny, killing over 200 000 people since 1994 . Of course, only Israel, the one country that went to pains not to harm civilians (and had a relatively low percentage of civilian deaths) is singled out for abuse, condemnation and vilification. Hamas also bears direct responsibility for civilian casualties in Gaza because it is a violation of international law to launch attacks from civilian infrastructure. According to the Geneva Conventions and other laws of war, civilians are to be protected and distinguished from combatants. This protection extends to civilian areas to minimize harm to innocents. Hamas provoked return fire on civilian areas by launching attacks from densely populated areas and, specifically, from inside and the vicinity of private homes, schools, mosques, and hospitals. In a report to the Israeli cabinet, Israeli intelligence chief, Yuval Diskin, indicated that the Gaza-based leadership of Hamas was hiding in an underground bunker beneath Shifa Hospital, the largest in the Gaza Strip. [11a] Hamas also endangered civilians by ordering its forces to discard uniforms and dress in regular clothes that made them indistinguishable from the civilian population. The rage over the T-shirts worn by Israeli soldiers highlights the selective anger of the world. While many brimmed with righteous indignation about these T-shirts, nary a word has been said about Hamas' explicit genocidal statements and the constant and deadly anti-semitic and murderous incitement in Arab culture. Some might argue that Hamas does not have the capacity to carry out these threats. However, when these threats are coupled with the proclamation of "wiping Israel off the map" by Hamas's Iranian puppet-masters, the situation becomes frightening. Former Canadian Justice minister, member of the Canadian Parliament and expert on international law, has said that Hamas is a "case study per excellence in war crimes" . We are told if there were no rockets than Israel would not have been compelled to massacre Gaza, but in the West Bank there are no rockets, but there are land seizures, there are checkpoints, there are regular IDF kidnappings, there are daily incursion into Palestinian communities, there are Jewish only roads, there are illegal settlements, there are attacks on peaceful demonstrations, and there is still the occupation. If peace is what Israel wants than it will engage the Arab world with words and not weapons. In typical anti-Israel fashion, history began yesterday. The Arab assault on Jews in Israel has continued unimpeded for over a hundred years. In 1920-21, 1929 and the 1930s, Arabs rioted and massacred hundreds of Jews in Jerusalem, Jaffa, Hebron, Safed, etc. This was before there was a state, let alone an "occupation" or checkpoints. When Israel declared its independence in 1948, its was attacked by a million Arab soldiers from 7 different countries. Again in 1967, Israel was threatened and attacked, before any "settlements". 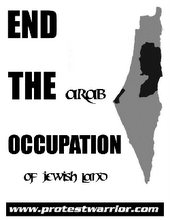 Israel has offered the Arabs peace numerous times. Former Israeli PM Ehud Olmert recently announced that he offered the PA more than even Ehud Barak did . Barak offered Yasser Arafat practically 95% of Judea, Samaria and Gaza, with a capital in East Jerusalem and control over the Temple Mount. In typical Arab fashion, Arafat wanted everything and walked away. "At one point, I put everything on the table and offered Abu Mazen [PA Chairman Mahmoud Abbas – ed.] an offer that had never been made before, that touched on the core of the conflict and the most heavily emotionally charged issues, the rawest nerves, the historical baggage,” Olmert said, recalling his negotiations with Abbas. “I told him, 'Come on, sign.' That was half a year ago, and I'm still waiting,” he added. I wouldn't hold my breath. In the recent Israeli elections, Avigdor Lieberman's party, Yisrael Beiteinu, won 15 seats in the Israeli Knesset. The party slogan of "no citizenship without loyalty" resounded with Israelis after they saw Israel's Arab citizens cheering on Hamas during the latest conflict in Gaza. Lieberman capitalized on the treasonous words and actions of "Israeli"-Arab MKs and on the general perception of Israel's Arab population as a fifth column. Speaking about Arab MKs, among them one who fled to Syria trying to escape charges of treason, Hamas and Fatah supporters and sympathizers, and several who have repeatedly met with Israel's enemies, while receiving salaries from the state, he said:"At the end of the Second World War, not only criminals were executed in the Nuremberg trials, but also those who collaborated with them. I hope that will be the fate of the collaborators in this house." Every year, as Jewish Israelis take to the streets to celebrate their Independence, Israel's Arab commemorate "Nakba" (Disaster) Day. On this day, they mourn, condemn and resolve to eliminate the state in which they are living and which gives them full democratic rights. Jewish Israelis are angered when they see people who are given more rights and privileges than any other Arabs in other Arab countries opposing the state. While there is certainly no reason to allow "Nakba" commemorations on Israel's Independence Day, it is quite hypocritical for Jewish Israelis to expect Arabs to dance and celebrate on Yom HaAtzmaut. It was recently reported in the newspaper that an Arab minister refused to sing Israel anthem, "HaTikvah". Understandably, Jews were furious that a minister in the government would refuse to sing the national anthem yet it seems unreasonable to expect an Arab to sing of the continuation of the 2000 year old hope, beating in "the Jewish soul", "to be a free nation in his land, the land of Zion and Jerusalem". No state is under any obligation to support and allow a fifth-column in its borders and I have no sympathies for the Arab citizens of Israel who took to the street to proclaim their admiration for Hamas. After a several terrorist attacks in Jerusalem, such as a massacre of yeshiva students and several bulldozer and vehicle attacks, by Arab residents of east Jerusalem, which were greeted by jubilation and rejoicing by the Arab citizens of Israel, few would argue that the Arabs are loyal citizens. In the words of "Israeli"-Arab protesters at Hebrew University: "we are all Palestinians now". There are no questions as to the identity of Israel's Arabs. 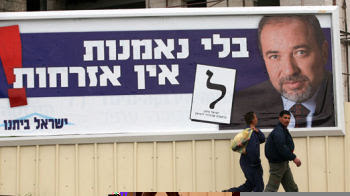 Nonetheless, I feel that Lieberman's slogan misses the point. 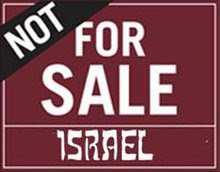 An even greater threat, in may ways, to Israel's continuity as a Jewish state, than the Arabs are the hundreds of thousands of Russian goyim brought from the former Soviet Union. Many of them are proud citizens, serve in the army, pay their taxes and support the state. Yet, despite all of this, they are not Jewish. Many of Lieberman's constituents are Russian immigrants who are not Jewish according to Jewish law. To appease them, some of his policies advocate a quickie conversion process, civil marriages, increased public transportation on Shabbat and allowing the sale of pork, all things that would hurt the Jewish character of the state. The loyalty of these Russian goyim cannot be questioned (excluding the neo-Nazis, I suppose) but they still cannot be considered full citizens since they are not Jewish. Liberman's proposal implies that Russian goyim, Arabs, Bedouins or Druze, if they sign a declaration of loyalty to the state, will be no different than other Israel. That is, in effect, a recipe for assimilation. 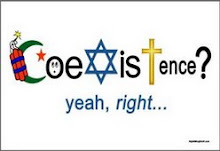 Israel was founded to be a Jewish state, to provide a homeland for the Jewish people. While Israel is a democratic country, to qualify as a Jewish state, it must have some sort of Jewish character. This includes the public celebration of Jewish holidays, stores and transportation closing on Shabbat, restrictions on the sale of pork, and the Rabbinate's control over the Jewish life cycle, such as wedding, births, funerals and burials. Around the world, Jewish communities are withering up and dying, with the exception of religiously-committed Jews, due to a frighteningly high intermarriage rate. Israel is (with the exception of Canada and Germany) the only Jewish community that is growing because of a normal and healthy birthrate. Judaism is blossoming and undergoing a revival in Israel, its birthplace. Lieberman's suggestions that being Israel simply depends on allegiance to the state are very, very dangerous for Israel's Jewish nature. He will import the Diaspora assimilation catastrophe to the Holy Land. An Arab cannot feel loyalty to the state that officially calls itself "the Jewish state", whose flag has a Jewish star at its center, whose anthem speaks of "the Jewish soul yearning". He cannot celebrate on the day which he was defeated, on which he feels (wrongly) that his land was taken away from him. To demand for him to give up his national pride and aspirations and sign a declaration of allegiance is simply condescending. The plans and attempts to turn Israel into a Western Hellenistic country and to divorce it from its Jewish heritage must be rejected. 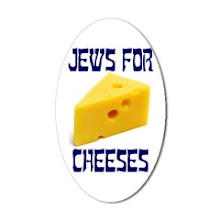 No matter how loyal a Druze or a Russian goy is, they are not Jewish and cannot marry a Jew. If the condition for "Israeli-ness" is mere loyalty, it will break down all boundaries between Jews and non-Jews, the boundaries that prevent intermarriage and guarantee Jewish survival. I do not argue with the truth that the Arabs must go, that Israel cannot allow a growing and hostile minority to attack Jews, aid Islamic terrorists and plot our destruction from within. The essential is to return to our Jewish roots, to realize that by running away from Judaism, we run away from Zionism. There is only one justification for building a Jewish state in the heart of the Arab world, in the middle of a billion Muslims. Why suffer and fight for this little piece of land if all we want is a good quiet life, to go to the beach, to shop, club and enjoy? There are close to a million Israelis living in NY, LA, Florida or in other warm places. 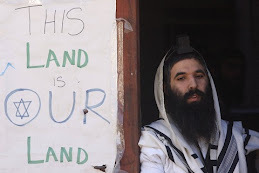 The only reason for the state is Judaism: to build a Jewish country in its ancient homeland. 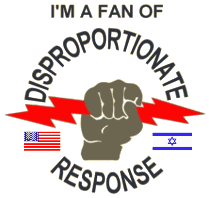 Israel is both Jewish and democratic, but both of these are not of equal importance. The world has many liberal, multicultural, secular democracies. Creating another one is not sufficient cause to antagonize half of the world's population. 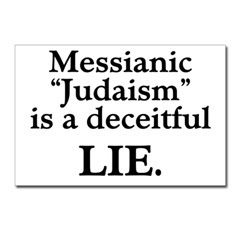 Israel's basis is firmly rooted in Judaism. Judaism demands separation from the nations, not to allow ourselves to assimilate and disappear. Lieberman's plans remove any concept of Torah or mitzvot from being a Jew, or being an Israeli. They are in fact suicide for Israel. A far better slogan would be: "The Nation of Israel, in the Land of Israel, according to the Torah of Israel."